On October 9, seven states and five environmental groups sued the EPA for failure to promulgate new emission standards for residential wood heaters. If EPA had done its job years ago, as it was obligated to do under the Clean Air Act, the stove industry and consumers would be far better off today. can be loaded in an outdoor boiler. Instead, we have all been dragged down by an agency that has not taken residential wood heating seriously enough. And some of the key outdoor wood boiler manufacturers have opposed reasonable state and local regulations on their products, leading to controversies with state air agencies and environmental groups that could be avoided. 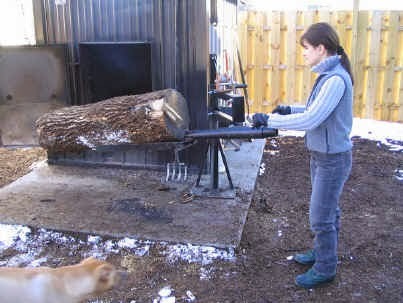 The EPA did develop a voluntary program to help regulate outdoor wood boilers and states started adopting that in 2007. Northeastern states, Indiana and Pennsylvania used that and Washington and Oregon effectively banned them outright. The states where outdo boilers are most popular like Michigan, Minnesota and Wisconsin, failed to use the EPA voluntary program to protect their residents from these polluting devices. Privately, most people in the wood heating industry agree that outdoor wood boilers have given us all a black eye. Those devices, particularly concentrated in the Great Lakes region, are contributing towards a negative view of wood heating at a time when the public and policymakers could have been developing a more positive view, as they have in Europe. But some outdoor boiler manufacturers, while officially saying that they want to be regulated, have fought in state after state to keep selling old-fashioned polluting boilers. And now they are fighting the EPA over what they feel are far too burdensome regulations. Meanwhile, in Europe, where such technologies don’t exist, governments are vigorously supporting wood heat technologies through rebates and incentives. One reason Europe has been able to incentivize wood heating is that almost every country has a green label to identify the cleanest and most efficient stoves and boilers, which gives lawmakers the ability to give rebates and incentives to the best products. In the US, there is no Energy Star program for wood heaters and industry has put the brakes on a state initiative to create a green label program. Once we have a green label program, I think we will start to see the tide turn, with states beginning to shift consumer purchases towards the cleanest and most efficient wood and pellet stoves and pellet boilers. In polluted urban areas, like Denver and Montreal and parts of the Pacific Northwest, we are likely to see more bans on the new installation of wood stoves and a shift toward pellet stoves. This may not be ideal, but it is also a reasonable response. Cordwood isn’t an appropriate energy solution for lots of people in densely inhabited urban areas, particularly those that experience weather inversions, when the technology is so dependent on operators using seasoned wood and giving the appliance enough air. In coming months, our community will be increasingly in the public spotlight as these lawsuits against the EPA get underway and we have a 90-day public comment period over the EPA’s long awaited regulations. We are in an era where technology can make wood and pellet stoves far cleaner, while still being affordable. Many of these stoves were on display the National Mall at the Wood Stove Decathlon in mid-November. There, policy makers saw what stove engineers are working on and are capable of creating. They saw first hand that wood heat technology is developing fast and can be a vital part of our renewable energy future, not just a relic of the past. Outdoor wood boilers are the most polluting class of residential wood heaters on the market today, and as such they will be the most in the news. But the EPA regulations are still vital in requiring both wood and pellet stoves to become cleaner and more efficient. Once that happens, public opinion can begin to shift in a more favorable way towards deploying modern wood and pellet technology to reduce our reliance on fossil fuel, and shrinking the divide between US and European policy.